Medan, April 21, 2018 .As part of a series of Earth Day 2018 commemorations commemorated every April 22 and the National Conference on Environment (KNLH-WALHI) in Medan, North Sumatra .W alhi organized the Hunting Waste Competition on al. 21st of april 2018.This activity starts from 09.00-13.00 which is centered at Lapangan Merdeka, Medan, North Sumatera. Waste is a problem in Indonesia due to inability to manage waste and unable to control waste production. While producers of various packaging (food packaging, drinking water packaging, electronic garbage, etc. ), seem to escape from responsibility for the waste they produce that have an impact on the environment. Dana Tarigan, Executive Director of WALHI North Sumatera, said, “It is undeniable that consumptive behavior that generates waste is contributed by massive” advertising-industry” efforts that create impact to environment. As an illustration of the impact, the waste generated by the inhabitants of the municipal area reaches approximately 2000 tons per day, some 1400 tons of it flows to landfills (TPA), the rest are scattered in places that should not be”. Waste can be categorized into two types, biodegradable waste and non-biodegradable waste. The waste generated in most cities in Indonesia is in the form of biodegradable waste. Waste management of this type is very easy. The rest of the food for example can be used for animal food. Other biodegradable garbage into fertilizer can be used with the method of managing a n composted.Many methods of composting from the simple to the very modern using tools and bacteria that speed up the composting process. Organic waste can also be used to generate energy by using biogas reactors. One more type of waste that is not easy to decompose or inorganic waste. This type of garbage can be easily recycled such as iron, aluminum, glass, several types of plastic one layer. Other garbage plastic multi layer, styroform, sachet , multi layer packaging and others can not be recycled.This type of waste can last for thousands of years. Melva, Waste Hunting Competition Committee added “Waste hunting contest provides an overview, what kind of garbage is all around us.From the garbage collected it will be seen, where the most garbage is scattered, and not managed properly.The contest is also to raise awareness of better waste management “. 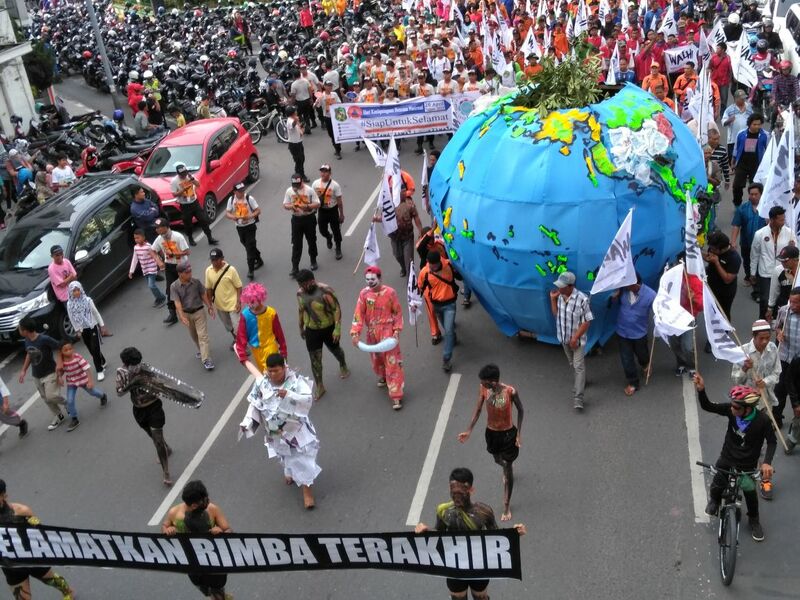 According to WALHI Executive National Urban Campaigner, Dwi Sawung “The waste hunting contest on Earth Day will show what kind of garbage is common in the city of Medan and which products produce the most waste. Producers must be responsible for the processing of such waste”.